The only dermal filler approved to treat aging hands by restoring lost volume. IPL, short for intense pulsed light, is a popular treatment that is best-known for its ability to treat vascular conditions like broken capillaries ("spider veins") and the brown spots or "age spots" caused by sun damage. 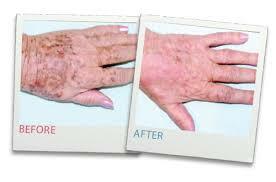 IPL also stimulates the production of collagen, which plumps up the skin and gives you a fresher look. IPL uses short blasts of a polychromatic, high-intensity light to penetrate just below the skin's surface, damaging either the melanin that makes up brown "age spots" or the blood vessels that create broken capillaries. The skin repairs the damage, leaving you with a more even skin tone.